Crime Stop helps police acquire valuable training tool. We are so very proud that we were able to help the Freeport Police Department acquire this valuable training tool. It is important that law enforcement agencies here in Stephenson County have direct access to the latest training technology. 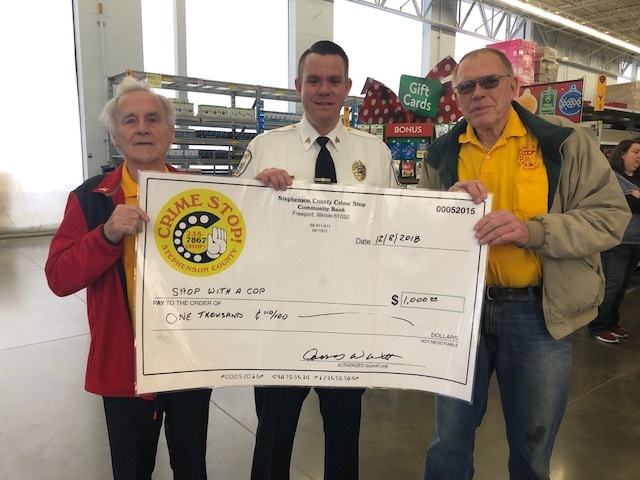 On December 8th, 2018, Stephenson County Crime Stop presented Freeport Police Department Police Benevolent & Protective Association (PBPA) Unit #9 with a $1,000 donation for use with their annual Shop With A Cop event. We are proud to support such a worthwhile cause in our community. If you are like a lot of people, you probably do not like having door-to-door sales people showing up at your house unannounced. If you want to keep door-to-door sales people away you need to have a "no soliciting" sign posted on, or near your front door. Stephenson County Crime Stop has printed no soliciting signs that can be obtained from us for free. These signs are the size required by Freeport City Ordinance.